Chiropractic and ADHD: Is ADHD Like A Ferrari? We’ve always heard that ADHD is problem, a diagnosis to place on our kids to describe the symptoms are kids are portraying. The media portrays ADHD as problem with our brains, where a circuit has blown a fuse and now we have a brain running “out of control.” The worst part is they say there is nothing really to be done besides medication. They say ADHD needs to be managed and that our kids and adults who have ADHD are “broken.” Is that true? I don’t think so. Think of a child’s brain with ADHD as a Ferrari. Just the name alone gives you a vision of driving down PCH at 100 mph. A Ferrari is the top of line for the sports car capable of tremendous power able to reach incredible speeds. Children and adults with ADHD have what we call “Ferrari brains,” meaning their brains are powerful, reach incredible speeds, and are basically stuck on the “gas pedal” all the time. This is what makes their brains so truly powerful and capable of so much. Have you looked under the hood of a Ferrari lately? Me neither. If you were to look under the hood, you would find a big engine (brain) and along with that you would find large brakes. A car with that much power needs some large brakes to go with it in order to properly control it and slow down. A Ferrari without those brakes is car just waiting to go out of control, but with the proper brakes it becomes a top of the line sports car. 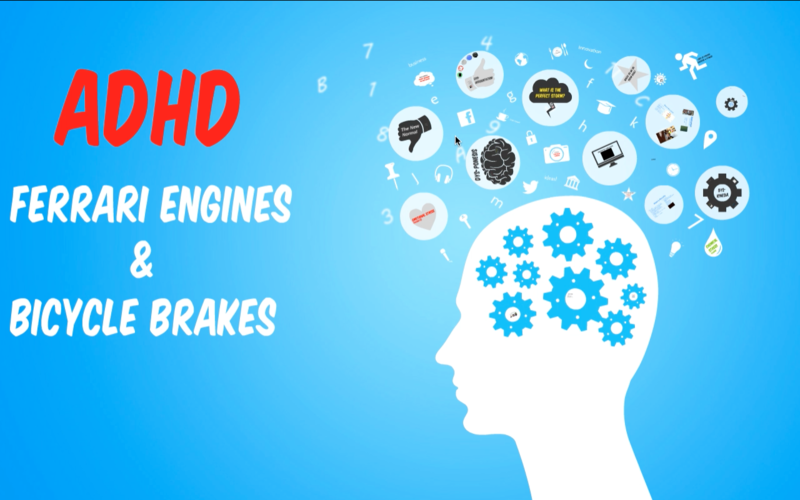 A child or adult with ADHD has the big engine but lacks the necessary braking abilities. They have the brakes of a bicycle essentially. This prevents them from being able to accomplish slower activities like slowing down, sitting still, transitioning and other slow moving activities. However when they get into fast moving activities like video games for instance, their ADHD magically disappears and they can focus intensely. Is Medication My Only Option? So how do we help our child apply the brakes? Are medications the only way to do that? Luckily no. Many parents and authorities are becoming much more aware of the potential dangerous side effects and addictive nature involved with the common ADHD medications. Chiropractic has been garnering plenty of attention in the media lately for the results it’s been having on children with ADHD. Check out our testimonial page to see some of our favorites. We’ve been lucky enough to be able to help so many children regain control of that powerful engine and thrive in life. We’ve children be able to get off some of those dangerous medications. Our care aims to slowly “pump the brakes” and help children balance. We’ve watched as emotional challenges, which are commonly linked with ADHD, slowly normalize and regain composure. Like us on Facebook or subscribe to our newsletter to stay up to date on our latest ADHD workshop coming in June.